Cyrel has an Honours BA in Fine Art and B.Ed from the University of Toronto. She was the Visual Arts Department Head at Unionville High School in York Region, where she designed the regional arts school (Arts York) programme in visual arts. Cyrel has taken art courses in Japan, England and Tennessee. She is a past president of the Ontario Society for Education through Art, and has written visual art curriculum documents for the province of Ontario. 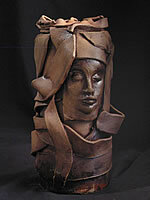 Cyrel works in a sculptural style using the portrait as a focus for her work.